All is going on well and then suddenly you notice that there is a raccoon on your porch! You will want to make it go away in any way you can but you will be afraid yourself. Now here are a few ways you can make it go away and prevent it from entering back again. Chase it away by shooing it with a broom or a stick. This will make it feel afraid and ultimately the raccoon will be gone. Seal the entry point through which you think it might have entered. Make sure that you seal it properly as the raccoon can break back through it easily. Install trappers on all the points the raccoon is most likely to pass through, this will trap the raccoon and you can live in peace. Raccoon are afraid of bright lights and strong odor. Make the most of this fear of the raccoons. Install bright lights on your porch so that the raccoon keeps away. If you are not in favor of the lights then you can install one of those odor sticks that are helpful in keeping away pests. Place a radio playing something over and over again to make enough noise for the raccoon to stay restless and to keep it awake. In this way it will leave the porch as it would not deem fit to the raccoon to rest. Sprinkle cayenne pepper on the entry/exit point of the raccoon. The smell of the pepper will keep it away. You can also try one of those pests’ repellents available in the market. Trim the branches of the tree that is present in your porch. Jumping and swinging around on the branches of the trees is considered to be one of the raccoon’s favorite pastime. Trim all the long branches which you think might have led the raccoon into your house. Keep your porch clean. Bag up all the food trash properly. Any traces of leftover food attracts the raccoons towards it. They are yearning to enter your living space only when they know that food awaits them. Build high and solid fences around your house. The fences should be strong enough to prevent the raccoons from entering in. In case still the raccoons manage to get in, immediately mend your fence, after chasing the raccoon away, to avoid the uninvited visit of the raccoons. 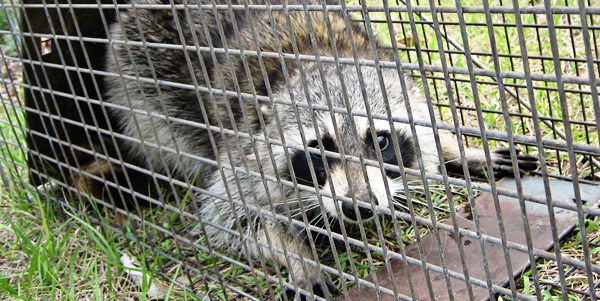 Even if the raccoon stays until your last try then call an animal control or pest control company to handle the situation professionally. Remember raccoons are really very smart and clever creatures and can make a fool out of you easily. You need be a step ahead of them and take all necessary precautions to keep them away from your house and to let you live your life peacefully. Go back to the How to get rid of raccoons home page.